The National Football League (NFL) is a professional football league in the United States. The league was founded in 1920 as the American Professional Football Association and played its inaugural season with eleven teams. Today, the NFL comprises 32 teams spread out over two conferences, the National Football Conference (NFC) and the American Football Conference (AFC), that each consist of four divisions. The NFL as a whole has increased its revenue every year for more than ten years now from around 6 billion U.S. dollars in 2004 to more than 13.5 billion U.S. dollars in 2017. In comparison, the revenue of Major League Baseball (MLB) was at 9.46 billion U.S. dollars in 2017, while the National Basketball Association (NBA) and the National Hockey League (NHL) generated around 7.4 and 4.4 billion U.S. dollars in annual revenue respectively. The Dallas Cowboys are the highest-grossing team in the league with 864 million U.S. dollars in revenue, with the New England Patriots, the New York Giants, the Washington Redskins, and the San Francisco 49ers rounding out the top-5 in terms of revenue in 2017. In 2018, the Dallas Cowboys are the most valuable franchise in the NFL with an estimated value of 5 billion U.S. dollars according to Forbes. League-wide franchises were worth around 2.57 billion U.S. dollars on average. Compared to the NBA, MLB and the NHL, NFL franchises are the most valuable. The least valuable franchise is the Buffalo Bills with a value of 1.6 billion U.S. dollars. The NFL is also the professional sports league with the highest average per game attendance, drawing more than 67 thousand spectators per game in the 2017 season, a total of more than 17 million. 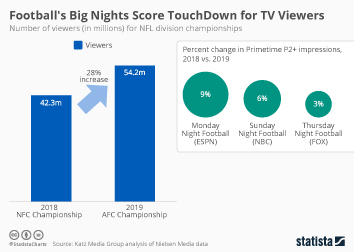 The annual championship game, the Super Bowl, is one of the biggest single day sports events in the world drawing high television ratings each year, generating several billion U.S. dollars in consumer spending.